With single-minded dedication he was the founder and chairperson of Young Socialists and agitated around anti-union legislation, the Vietnam War and the North of Ireland civil rights campaign. To express their solidarity with the 1968 Paris student protests and the workers’ general strike, the Young Socialists held a demonstration outside the French Embassy in Dublin. At this solidarity action, Peter said “this tremendous opportunity for the victory of socialism may again be lost unless a revolutionary working class leadership emerges in France”. Later that year Peter and the Young Socialists held a protest in Abbey Street against new anti- trade union legislation, holding a banner with the words “hands off our trade unions”. Addressing the protesters, he argued that “trade unionists, tenants and farmers must form an alliance to oppose this anti-union legislation”. He also participated in the North of Ireland civil rights march in Derry on October 5th 1968 which was brutally attacked by the RUC. Following this event the Young Socialists decided to hold a march in Dublin in solidarity with the civil rights movement. It was intended to march to the British Embassy in Merrion Square, but the marchers were prevented from reaching the Embassy by a cordon of over a hundred gardai. Afterwards Peter told the gathering that because of the police, they were being prevented from making their rightful protest outside the embassy. This was the first such demonstration and that they would be back again in larger numbers. Peter was subsequently recruited into the organisation of the new Marxist-republican organisation Saor Éire in 1969 by Frank Keane, its national organiser and a former O/C of the IRA’s Dublin Brigade. Keane was later charged with killing a policeman during a Dublin bank raid and Peter became a leading member of the Frank Keane Defence Committee, along with Sean Matgamna and Liam Daltun. Frank was eventually acquitted. Peter left for London where he helped in building the International Marxist Group, the British section of the Fourth International. Along with Tariq Ali, Bob Purdie and Liam Daltun he assisted in publishing the newspaper of the IMG, Red Mole. He also arranged an interview by Bob Purdie with two Saor Éire members in London; the interview was published in Red Mole and subsequently translated into several languages. While in London he and Liam also wrote and published the Saor Éire Manifesto in May 1971. On his return to Dublin and working with people in the Revolutionary Marxist Group, such as Rayner O’Connor Lysaght and Máirín Keegan, he established the Irish Section of the Fourth International and saw this as complementary to his involvement with Saor Éire. In a tragic turn of events, however, Peter was assassinated in a flat he shared with his comrade O’Connor Lysaght at 101, St Stephen’s Green; he was only 26. News of his death was greeted with shock by Irish and British socialists, and it remains unsolved. Bob Purdie said “when Peter requested permission to return to Dublin to help build the Revolutionary Marxist Group, if I had got any inkling of the truth, that I was sending him back to mortal danger, I would never have agreed”. Sean Matgamna who saw him a few days before his death said “Had he survived physically, Peter Graham would have survived politically, and grown”. The Provisional IRA released a statement in which they said his death had come as a severe blow to the national resurgence and that he had provided aid of all forms in 1969. The IRA statement came as a surprise to many Trotskyist colleagues who were not aware of his activities in relation to Saor Éire and the North. As a mark of respect the National Conference of the Young Socialists, due to be held that weekend in Galway, was postponed. His funeral cortege was preceded by two young women who carried the Plough and the Stars flag, the symbol of the revolutionary working class in Ireland, and members of the Young Socialists and Saor Éire carried the coffin along Meath Street, on route to Saint Catherine’s Church. Hundreds of working people lined the footpaths in silence, shops closed and houses had their window blinds drawn. Various left-wing political groups and activists attended the funeral, including Bernadette Devlin, MP, Mairin Keegan, Eamonn McCann, Michael Farrell and Butch Roche. They marched behind the coffin draped with the Plough and the Stars to Dean’s Grange cemetery. Showing the threat that the state perceived Peter to have been, Special Branch detectives sprinkled themselves within the funeral crowd of several hundred. 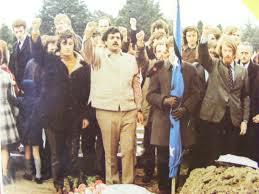 The oration was given by Tariq Ali of the IMG, who said “there were not many Peter Grahams in our movement and his death is a blow not just to building the Fourth International in Ireland but to the Irish working class, which had lost a leader of great potential”. Several verses of The Internationale were sung and the clenched fist salute was given. “It was heartening however to see the Young Socialists taking the initiative on this question, (Paris 1968) and they deserve full support from all real militants. The day will come when consistent Marxist politics will win through”. Mick Healy is the founder of the Irish Republican Marxist History Project and is a regular contributor to this blog. 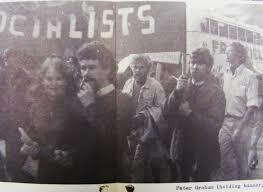 The Project is holding a commemoration of Peter Graham in Dublin next month. See the poster below this article. Posted on January 27, 2017, in Commemorations, Democratic rights - general, Economy and workers' resistance, General revolutionary history, Historiography and historical texts, Labour Party, Partition, Political education and theory, Prisoners - past, Public events - Ireland, Repression and resistance in 1970s and 1980s, Repression in 26-county state, Republicanism post-1900, Revolutionary figures, Saor Eire, Secret police, Trade unions, Workers rights. Bookmark the permalink. 4 Comments. Three points on first reading: 1.Pete was in the Irish Workers Group (1967-8) before he joined the LWR (a breakaway from the former). 2.The Brit Embassy was in Merrion Square, not Merrion Row; 3. Carol Coulter was never in the Revolutionary Marxist Group. Cheers. I thought Mick’s mention of Carol Coulter being in the RMG sounded odd. I’ll correct the stuff you pointed out; should have picked some of it up when I first read it. I didn’t realise he shared a flat with you and that was where he was murdered? Who found him? Did you move to a new flat? Also, can you clarify something. Did people like Peter and Mairin hold dual membership in Saor Eire and the RMG? I always thought the RMG came afterwards. To reply: Firstly, Yes he was sharing a flat with me when he was murdered. I was not there that night as I was in Galway (Otherwise I might have suffered the same fate). The flat was 110 (not 101) St Stephen’s Green. I think it was the caretaker who found the body and, yes, I was evicted and moved to stay at the Keegan house in 5 Parnell Road, Harold’s Cross. As far as I know, Pete had left SE when he went to London to join Red Mole; he did not rejoin on his return. Mairin was a member of SE when she died; the q. whether she would have dual membership with the RMG was under consideration. The point there is that the RMG had not been formed when Pete was murdered; it was due to constitute itself a couple of weeks later. Naturally it was postponed until Mairin had died, too.